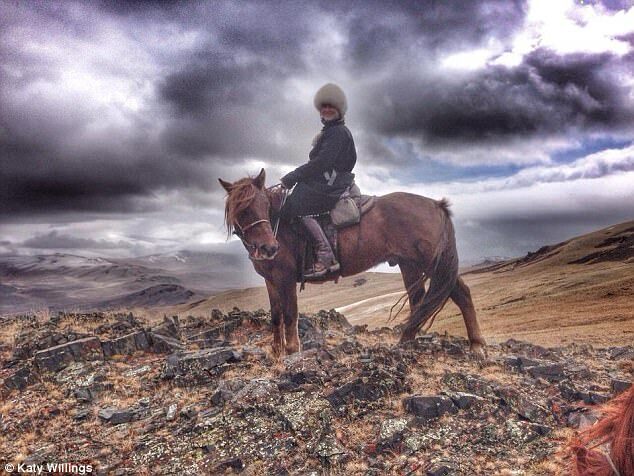 Whether it is horse riding across Mongolia's rugged terrain or motorcycling through Siberia, Katy Willings has a knack for looking perfectly at ease in settings that would push most others to the brink of their physical limits. But then again, she has had plenty of practise. The 34-year-old has completed feats of physical endurance in some of the world's most remote and unforgiving locations. This spirit of intrepidness is made all the more remarkable because up until a little more than eight years ago Katy was working as a 'depressingly mediocre' management consultant in London. The new, adventure-seeking chapter of her life began when the tragic and sudden death of a close friend led to her signing up to take his place in a 3,000km rickshaw race in India just weeks before the January 2009 start date.